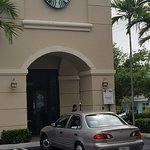 There aren't enough food, service, value or atmosphere ratings for Starbucks, Florida yet. Be one of the first to write a review! Very tough parking and navigating,Friendly service with well made drinks.Cute little area outside but had the typical Starbucks campers with labtops taking up whole tables with one person. I went here for my free drink on my birthday. I appreciated the free treat of a new flavor and the friendly customer service. Either my husband or I visit Srtarbucks nearly every morning from January to mid-May to pick up my venti non-fat 7 pump classic chai tea latte. They always do a great job of making my tea and are always pleasant & friendly. Loving sitting outside atthis location! I order a mocha frappuccino. It was delicious. I also had a very nice guy who took my order. This is one starbucks I would go to again. This was a typical Starbucks that I popped into to pick up a coffee for my brother. The seating area was limited, baristas were polite, but alas, it is a Starbucks. Not a huge fan of Starbucks coffees, but the blonde roast is not as bitter as their other brews. Typical Starbucks offerings and atmosphere. This Starbucks is in a convenient location. Everything else is of typical Starbucks quality. Not directly accessable from the main street, but not too hard to find.